In a medium saucepan, boil together blueberries, sugar, salt, lemon juice and lemon strips over medium heat. Simmer for 5 minutes, stirring occasionally, remove from heat and cool down. Discard the lemon peels. In a blender, puree blueberry mixture with milk until smooth, stir in heavy cream. Pour puree into a bowl, chill covered for about 2 hours, and up to 1 day. Freeze mixture in an ice cream maker. Transfer ice cream to an airtight container and put in the freezer to harden. It's ice cold here, but I still have the appetite for this wonderful ice cream! Let's just say the canister for the ice cream maker just popped its little self into the freezer. Those pesky little buggers tend to do that, don't they? Thanks, Yadsia. I just got back from visiting your lovely blog. Your recipes and photos are amazing! Love, love, love them. Mmmm, that looks so delicious. 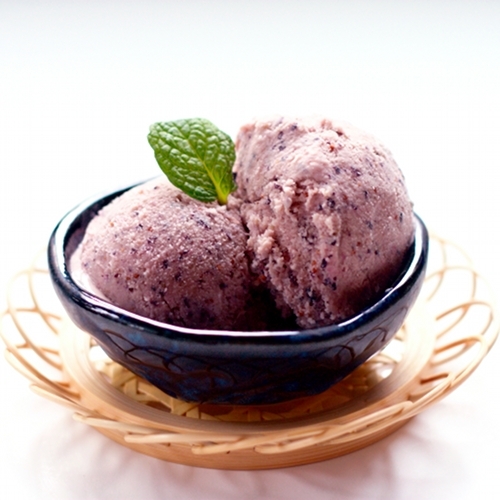 I love blueberry ice cream! This was a great, fun, good tasting treat. We all loved trying it out. I was very impressed with recipe!